In 2004, Tariq Ramadan, the Swiss writer and activist, was banned from entering the United States, after authorities found that between 1998 and 2002, he had given $1300 to Association de Secours Palestinien, a Swiss-based charity designated by the Treasury Department as a front group for Hamas. But in 2010, under a new administration, the then-Secretary of State Hillary Clinton decided to lift the ban. Since then, Ramadan has become a regular visitor to our shores, frequently addressing crowds at large Islamist-run conferences across America almost every year. 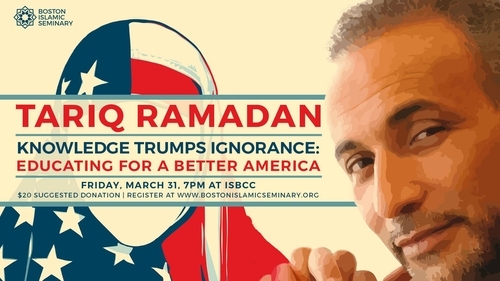 Ramadan's next visit, on March 31, will feature a lecture at the newly-founded Boston Islamic Seminary, a project of the Islamic Society of Boston. The hosts and the guest are a perfect match. Both have a long history of extremist links. And both have managed to dupe much of the political establishment into treating their work as an example of moderate Islam. It is certainly not that. "Ramadan finds nothing to reject in al-Banna's supremacist ideas; he has been accused of links to terrorists; he has justified bombings in Israel, Russia, and Iraq as legitimate resistance; he went no further than calling for a 'moratorium' against stoning while the practice is debated; he supports restrictions on the public lives of women; he demands that integration take place on Muslims' terms; and he led a boycott against the 2008 Turin Book Fair because it honored Israel." The Islamic Society of Boston (ISB) is not much different. Its founding trustees included Yusuf Al Qaradawi, the spiritual leader of the Muslim Brotherhood, and Abdulrahman Alamoudi, an Al Qaeda operative who was jailed in 2004 for conspiring with the Libyan regime to assassinate a Saudi Crown Prince. As with Ramadan, the Islamic Society of Boston's officials, clerics and guest speakers have expressed overt anti-Semitism, misogyny and apologism for terror. A comprehensive report into the ISB, published by Americans for Peace and Tolerance, can be read here. Also like Ramadan, the ISB has found welcoming arms to thrust it back into the political limelight. Despite twelve of its congregants, supporters, staff and donors having been imprisoned, deported, killed or on the run -- all in relation to terrorism offences -- the ISB is now the darling of the Boston political elite. Boston's Mayor, Elizabeth Warren and senior law enforcement have all recently spoke at the mosque – with Boston Police Commissioner William Evans at one point declaring: "We're all Muslims deep down. We all yearn for peace." The Boston Islamic Seminary is the latest brainchild of the ISB. It is one of a growing number of seminaries in the U.S. designed to produce homegrown clerics, trained by Islamist teachers. Islamists have conquered much of the American Muslim community politically; now they are working to acquire theological control. A number of Muslim anti-Islamists opposed Clinton's decision, back in 2010, to lift the ban on Tariq Ramadan. That concern seems small in contrast to today, as politicians bestow praise on a terror-linked mosque that has tasked Ramadan, and his fellow activists and clerics, with normalizing Islamism among the next generation of American Muslims.